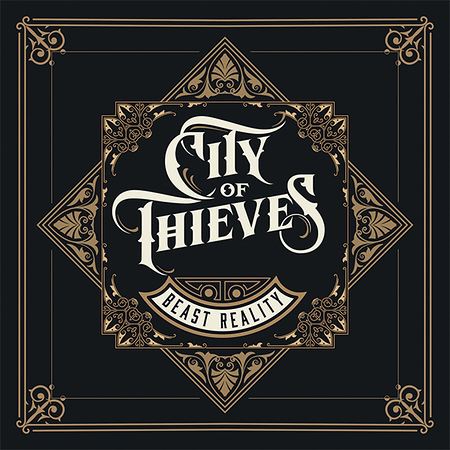 English band City of Thieves released their debut album “Beast Reality” through Frontiers Music on 12th October. This follows the release of their EP “Incinerator” back in 2015 – tracks from that EP have been included on the Shows a few times. The band produced the new album alongside Toby Jepson. A number of singles have been released ahead of the album and four tracks have now featured on the Friday NI Rocks Show over recent months – “Buzzed Up City” (20th April), Born To Be Great (22nd June), “Reality Bites” (7th Sept) and “Fuel and Alcohol” (2nd Nov). City of Thieves formed in 2015 with the band members all having toured around the UK in previous bands. After signing with Strangeworld Management the band started working on an album and released the five-track EP “Incinerator”. This EP includes 3 tracks that feature on the new album. Since 2015 the band have been touring and playing festivals ahead of releasing the debut album. They’ll be supporting Inglorious on their tour around England and Scotland early next year. The original City of Thieves line-up was Jamie Lailey on bass and vocals, Will Richards on drums and Ben Austwick on guitar. An additional guitarist was recruited with Adam Wardle joining the band.